In my twenties, I had, for a short time, a rather difficult roommate. She and I constantly disagreed over housekeeping issues. Should there be a box of tissues in the living room? Do we need a paper towel holder in the kitchen? How often should the carpet be vacuumed? What is the best way to place glasses in the cupboard? How strictly should food expiration dates be observed? The final straw for me was when her creepy boyfriend stayed overnight and left cigarette butts floating in the toilet. Yecch! One of our many petty arguments had to do with putting knives in the dishwasher. One of us thought the blades should be up, and the other thought they should be down. It's obvious which way will result in cleaner knives, isn't it? That isn't a disagreement I have with my husband, but I was reminded of it recently when I read an article by Alisa Bowman on her Project Happily Ever After blog. She suggested running a simple test, a solution that didn't occur to me or my roommate years ago, and one that seems to occur to very few people now. So I tried it. 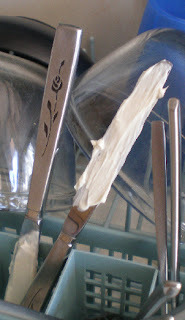 I coated the blades of two table knives in cream cheese. I put them into the dishwasher, one with the blade up, one with the blade down. Then I processed a full load of dishes with the settings I normally use. 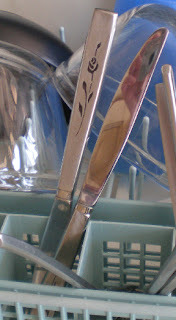 Not only did I confirm that the knives will be equally clean no matter which way we turn them, but I learned that this old dishwasher is more effective than I imagined. No more pre-rinsing! Simple experiments like this can be used to address disputes over matters of fact. But be careful not to use this as an "I told you so" moment! Avoid gloating, and let your spouse be gracious (or not) in defeat. Of course, there is always the chance that you might not be right after all. Try to take it calmly. I love how you and Alisa always find ways to improve upon relationships. What a clever idea to try it, expand upon it, and share it! Now, our dishwasher really stinks. I guess that means that the knives would both be dirty - still proving your point that it doesn't matter! Ha!!! This is a great reminder of the power of evidence. Most reasonable people - most, when presented with hard evidence like yours will back down from a long-held, false belief. Tammy and I have been tearing down one ludicrous belief after another from our pasts for the past 10 years or so and it has opened everything up, making our marriage ultra-transparent and easily navigable. Highly recommended. I love Alisa Bowman's Happily Ever After blog. And I love that you don't use the fatal "I told you so" mistake. Good on you!